Wow, it's amazing how we're already in June and half the year has already flown by. The school year is winding down for my kids and would you believe they'll be out on summer break in just a couple of weeks? Now that their end of the year exams are out of the way, their schedule at school is much more laid back with lots of parties and celebrations going on. Early last week, my son told me that one of his favorite teachers (his English teacher) got "the pink slip" from the district and won't be returning next year. Getting the "pink slip" is basically getting laid off due to budget cuts (something the state of California still cannot get around to resolving). Having heard that his teacher loves Asian food, especially Thai food, he wanted me to cook something nice for her, to thank her for being a great teacher. 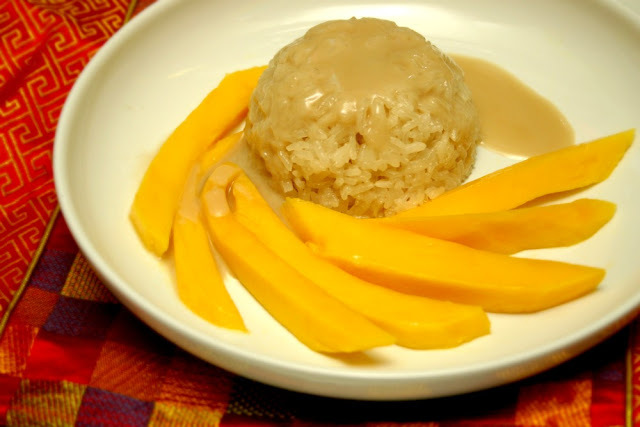 I was only too happy to oblige so we decided on Thai sticky rice with mango, one of her favorite desserts. This is a very simple dessert to make using only a few ingredients. The rice does need to be pre-soaked overnight or for several hours but once you get that out of the way, the dish comes together in no time. My son presented the dessert to his teacher last Friday and he told me she loved it and was very touched. It was the least I could do. Recipe adapted from Epicurious. Makes about 8 servings. Peel and slice the mango then set aside in the refrigerator to chill. Use Asian mangoes from either Thailand or the Philippines if possible. 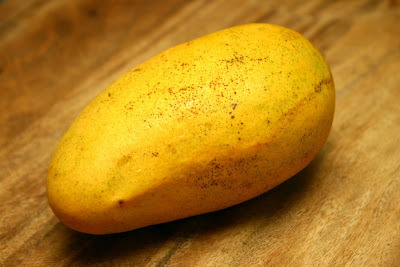 This is a mango from the Philippines which has yellow skin when ripened. 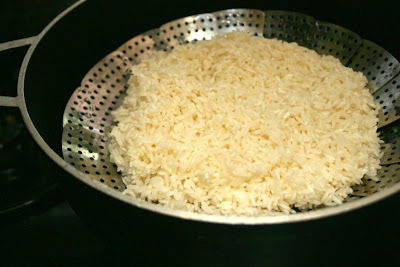 Drain the sticky rice (after having soaked it) then place in a stainless steel basket steamer. Place the steamer in a pot filled with a couple inches of water. Make sure the water does not touch the bottom of the basket. Cover the pot and bring the water to a simmer. 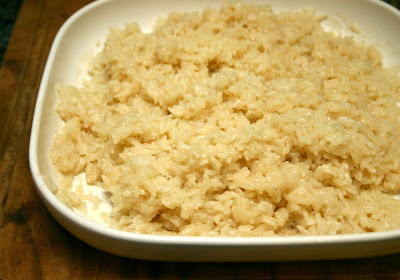 Allow to steam for 25 minutes, until the rice is soft and tender. Make sure to check on the water level in the pot and add water as needed. When the rice is ready, transfer it to a large plate and set aside. While the rice is steaming, prepare the sauce. 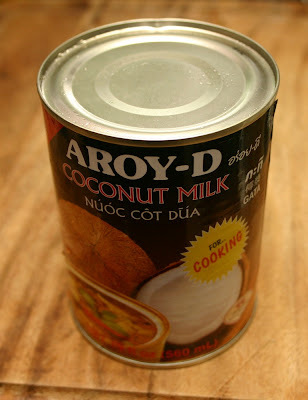 I like Aroy-D brand coconut milk. 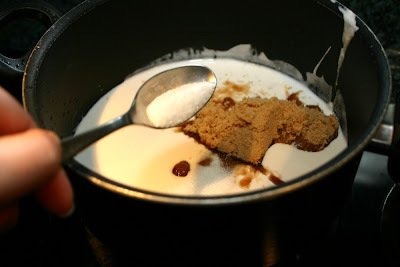 Pour two cups of the coconut milk into a pot then add the brown or palm sugar and salt. 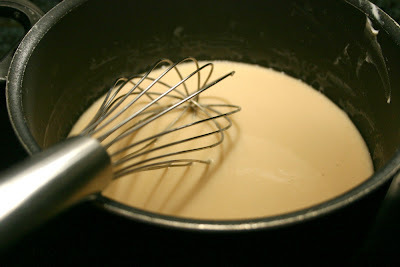 Heat the milk over low heat and gently whisk until the sugar has dissolved. Don't allow the milk to boil. 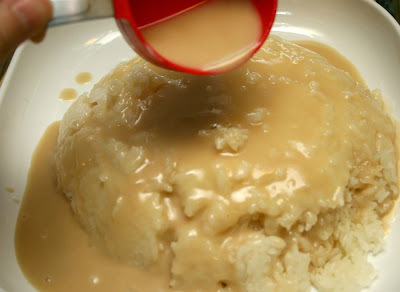 Pour 1 cup of the sauce over the sticky rice. Stir to mix and then let it sit for about 30 minutes to absorb the sauce. 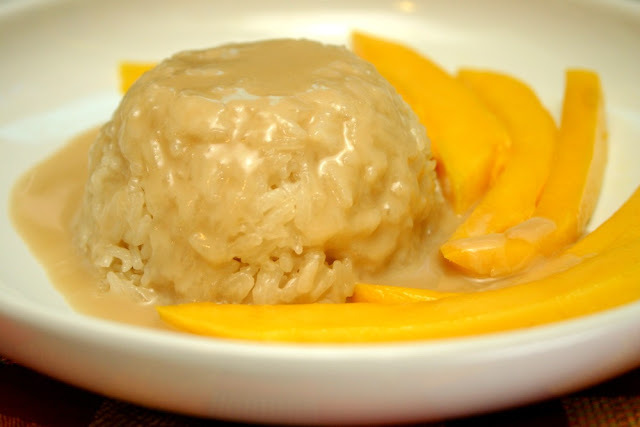 Shape the sticky rice into a mound with a small bowl and plate with the sliced mangoes. Top with more sauce as desired.